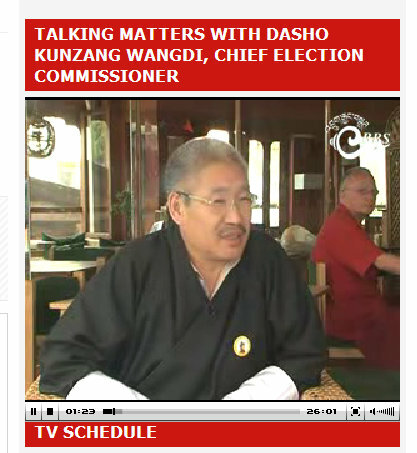 I often enjoy watching Dawa's People's Voice and Namgay Zam's Talking Matters. The most recent episodes of these (and other) programs are available for streaming on the BBS website. (In fact, since BBS1 is still not available off-the-air, the website is currently my only of watching BBS1) Older episodes, however, are taken offline because the server cannot handle the load. YouTube can offer serious help. BBS can create an official channel on YouTube (it's free), upload all videos to that channel, and then users can watch all programs directly on YouTube. This approach has various advantages: An unlimited number of videos; people around the world have a fast and reliable access to the BBS content; the BBS servers are now totally off-loaded; and lastly, a copy of the content is stored on Google's servers for free - a crucial backup in case of a disaster. A YouTube channel can be of use for other organizations as well. Here's more information about YouTube for Businesses. Update: @namgayzam's recently tweeted that "jst spoke to our webguy n he says Channel2 uses it more, but we'll start using it the same for channel 1! Thank you:)".